Students must have completed all English–language arts (ELA) requirements for graduation with an overall grade point average (GPA) of 2.0 or above in those classes. Pass a foreign language Advanced Placement (AP) exam, including American Sign Language, with a score of three or higher. Achieve Early Advanced proficiency level (4 overall) on the California English Language Development Test (CELDT), which may be administered an additional time, as necessary. Meet the requirements above as stated in 1 and 2. 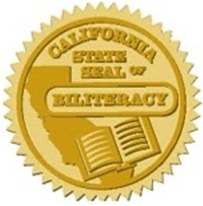 Orange Glen had the greatest number of Biliteracy Seal earners as compared to all schools in Escondido Union High School District. We produce the most biliterate and bilingual students, many of whom go on to earn college credits in language before even graduating from high school. We hope that we can share our bilingual and biliteracy skills with the community as we prepare students and our community for movement into the 21st century!